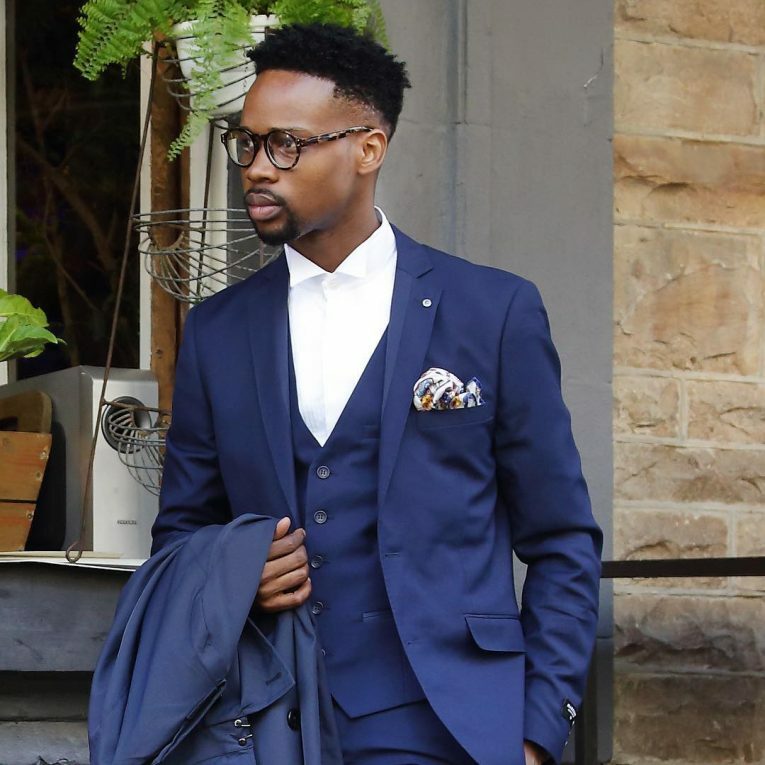 Whatever be your taste, whatever be the occasion, the classic three-piece suit for men can be an ultimate choice for you when you want a distinguished & stylish look. Needless to mention, these apparels efficiently combines both muscularity and style. 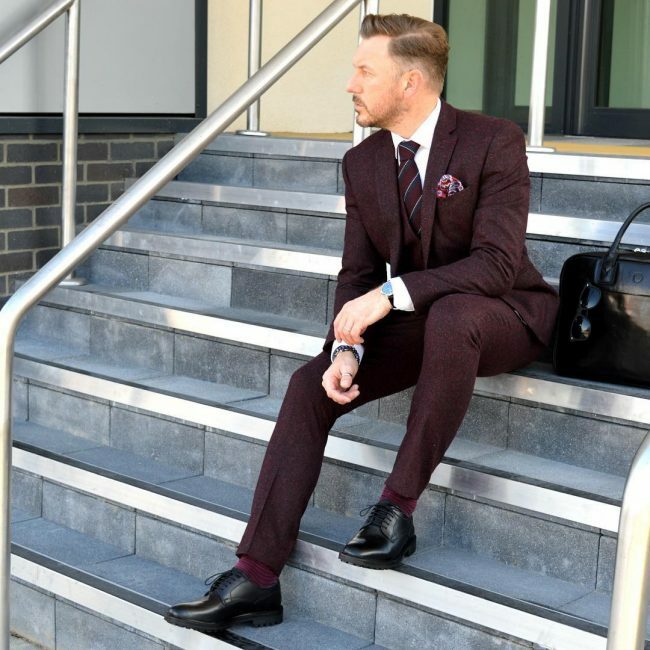 Whether you want a formal office-specific look or you simply want to stun your special guests by wearing a trendy party-type suiting – these three piece outfits can be just apt for you! 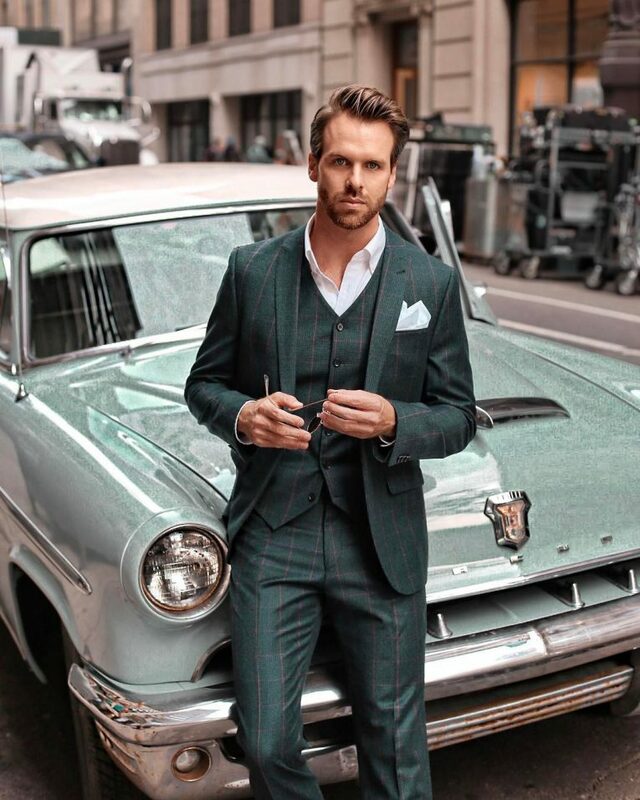 So, if you’re a man who appreciates and takes pride of his appearance, then take a close look at this collection – a solid collection of 40 three piece suits for men to match both informal occasions and formal events. 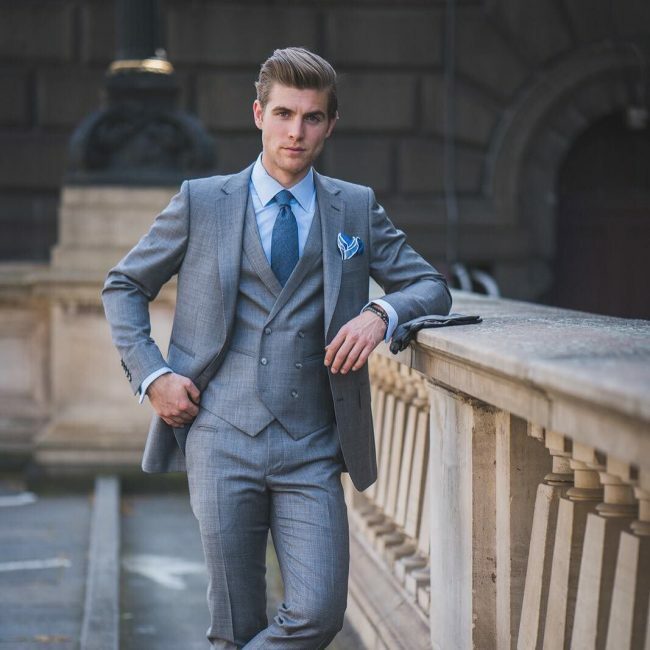 In this picture, the model is wearing a classic silver gray colored suit with a matching trouser and waistcoat. 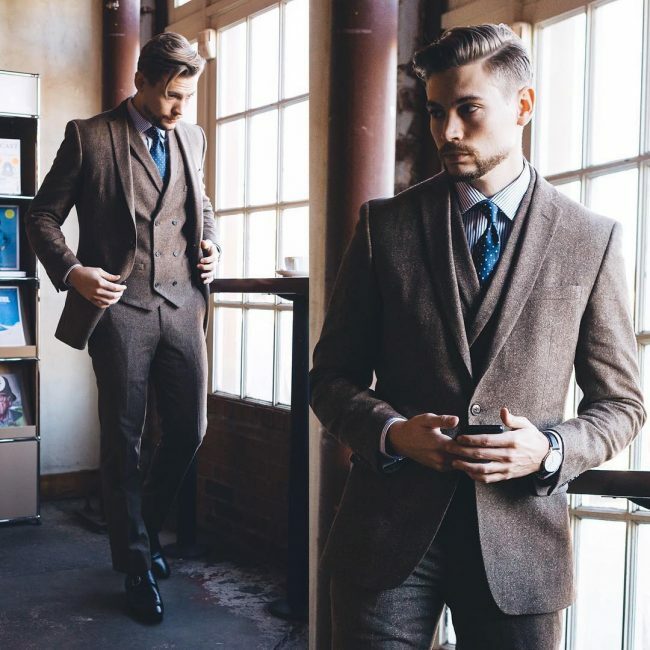 Surely, this exclusive three piece suit can provide you a stunningly stylish, modern, and sophisticated look. 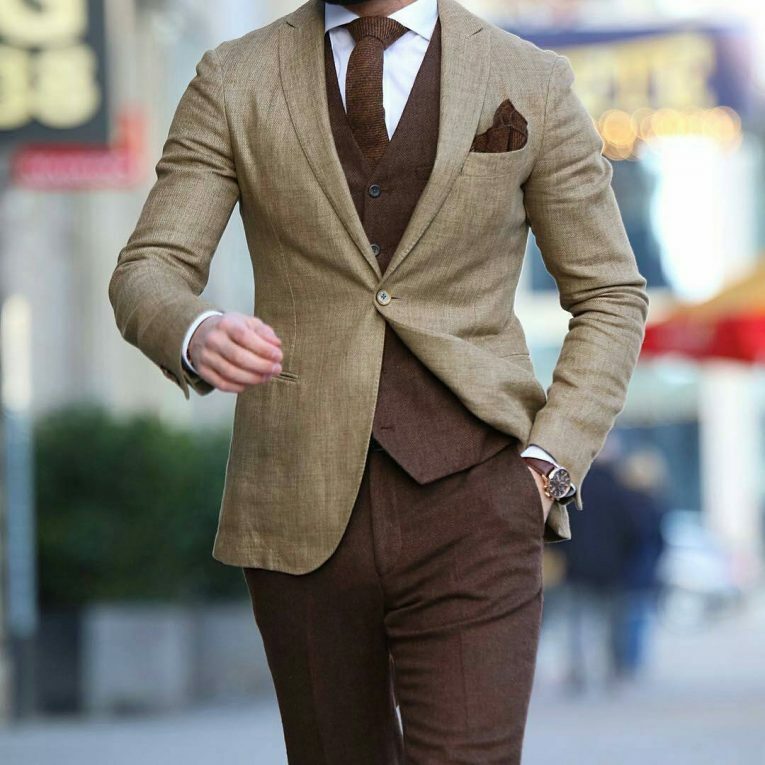 Also, don’t forget to wear a brown sunglass, a matching formal tie, and a pair of formal shoes to further elevate your look. When you want to look at your best, don’t forget to wear this exclusive apparel. 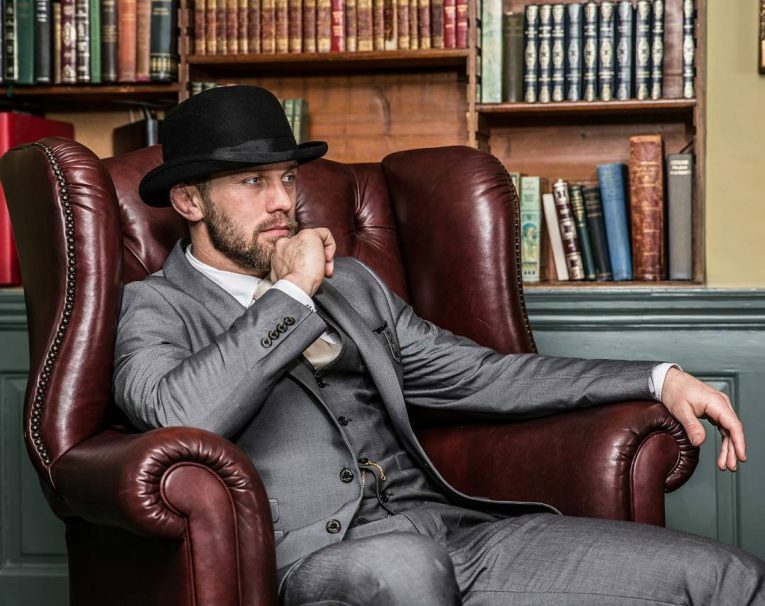 It comes with a hip-hop style suit along with a matching trouser & waistcoat. Also, spice it up with a stylish sunglass & a pair of white casual shoes – you’re bound to get an ultra-polished & trendy look. This outfit is a perfect combination of both traditional and trendy modern look. 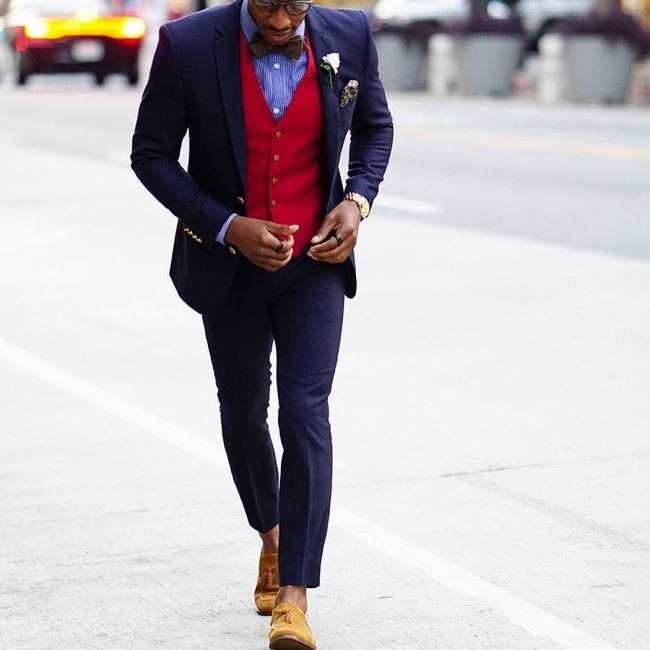 Here, the model has worn a navy blue-colored classic suit, and eventually paired it up with a matching trouser, vibrant red-colored waistcoat, and a pair of fashionable sockless loafers. 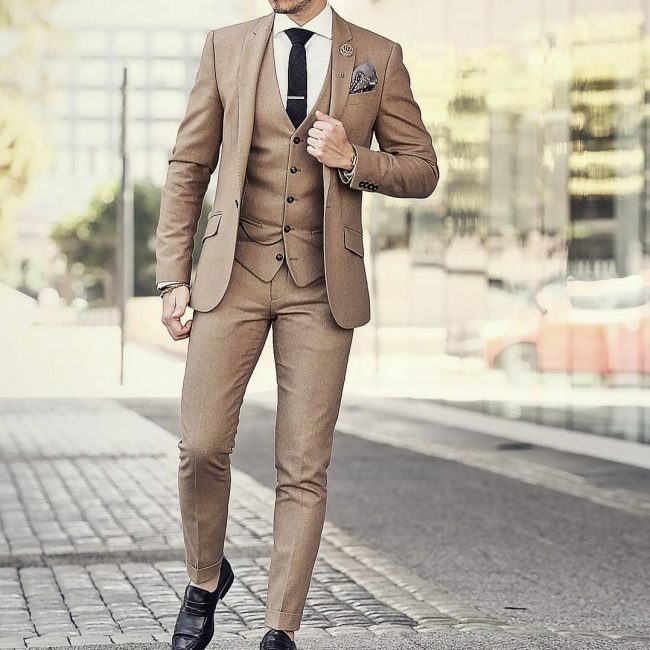 If you’re interested in chic & dandy outfits or elegant gentleman looks, then this is the perfect outfit that you should obviously try. This particular outfit certainly gives the wearer an ultimate stylish look which is surely eye-catching and visually attractive. 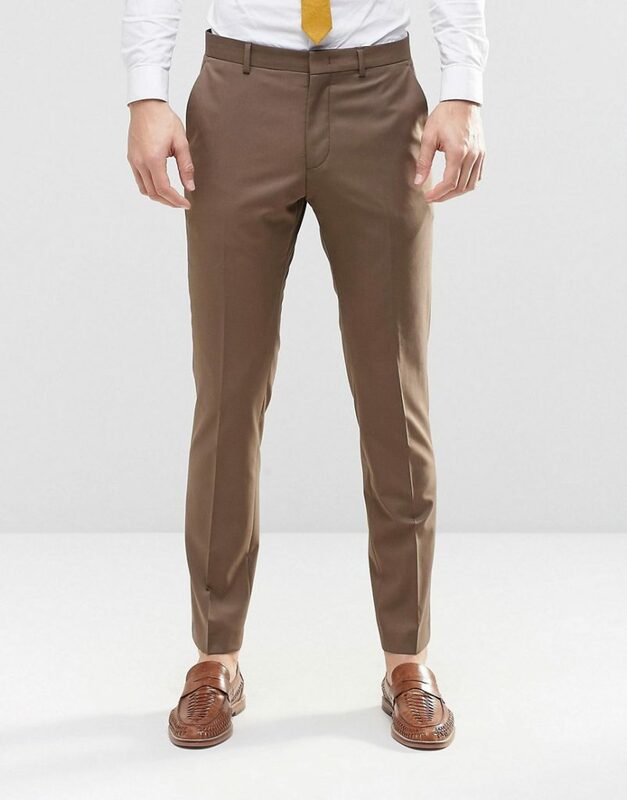 It comes with a blue suit, a waistcoat in dark chocolate color, and a trouser in light khaki color. 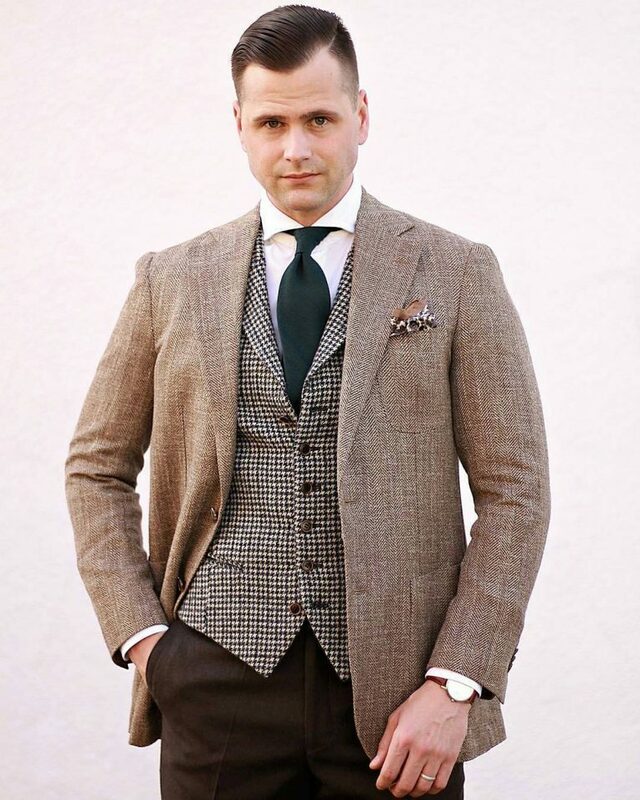 Traditional three-piece suits can give you a great gentleman look and this men’s apparel is also not an exception. This particular outfit not only gives you a royal & elegant look, but also it helps you to represent your own style and sensation too. When you choose a perfect color combination (which suits your tone), you can easily carry a flawless and fabulous look. 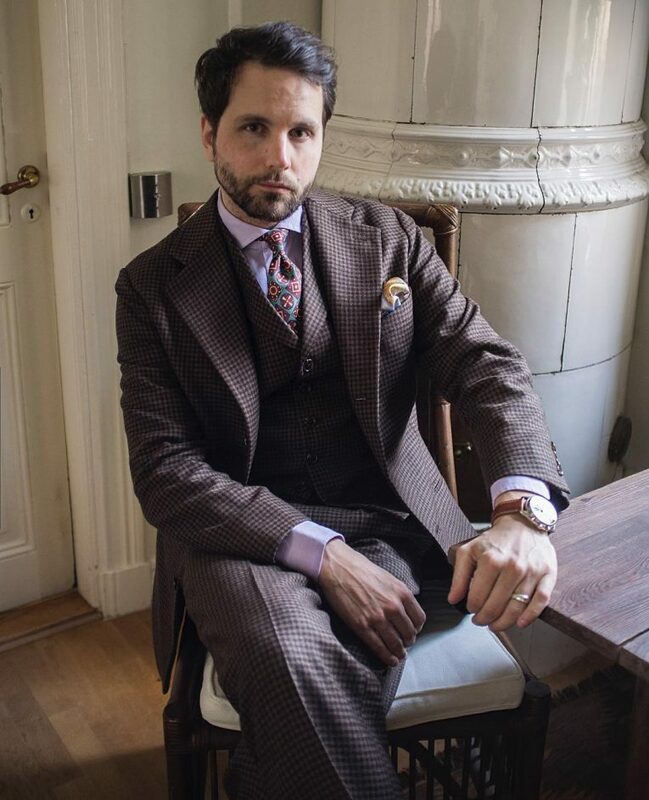 In this picture, the absolute bespoke men’s apparel comes with a gray-colored suit, a perfect trouser, a black waistcoat, and a tie with random patterns. In this picture, as you can see, the model is wearing an exemplary and exquisite suit which has a vibrant & gorgeous black color. 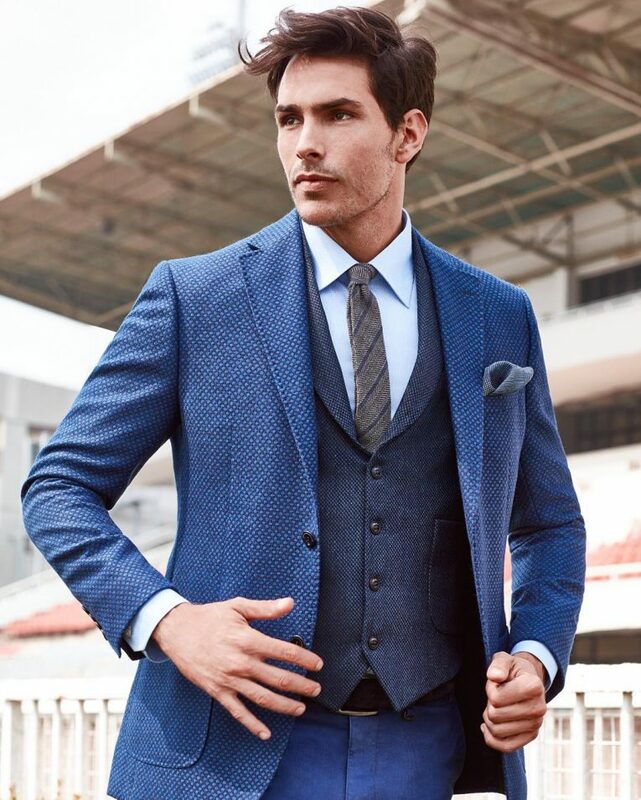 To elevate your style more, spice it up with a light blue-colored formal shirt, a black trouser, black waistcoat, black formal shoes, and an elegant watch. 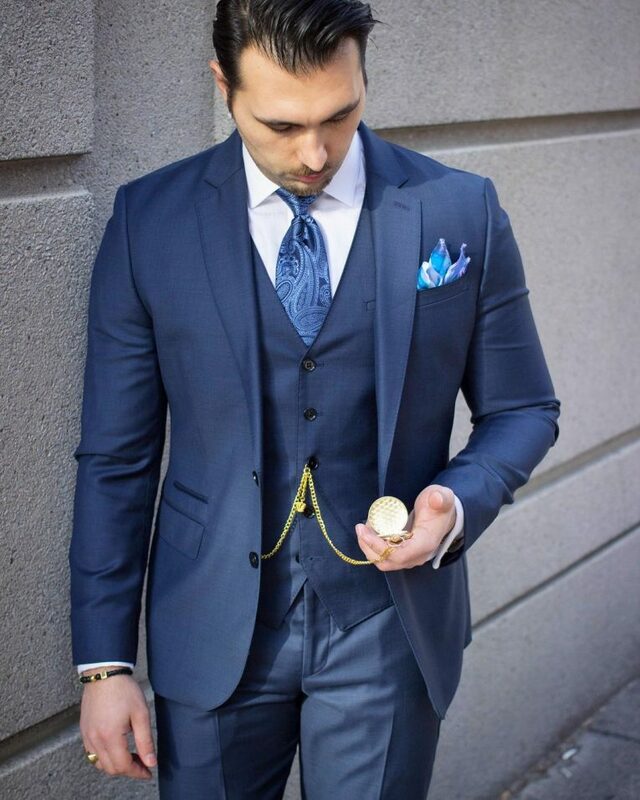 Most of you probably have a suit with traditional blue, black or gray color. 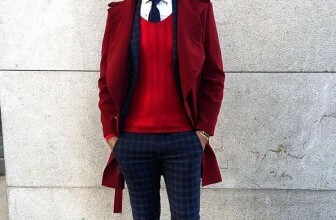 If you’re looking for a traditional outfit (but in a different color) for a vintage and unique look, then go for this apparel. The color choice is completely different, that makes this outfit even more appealing. 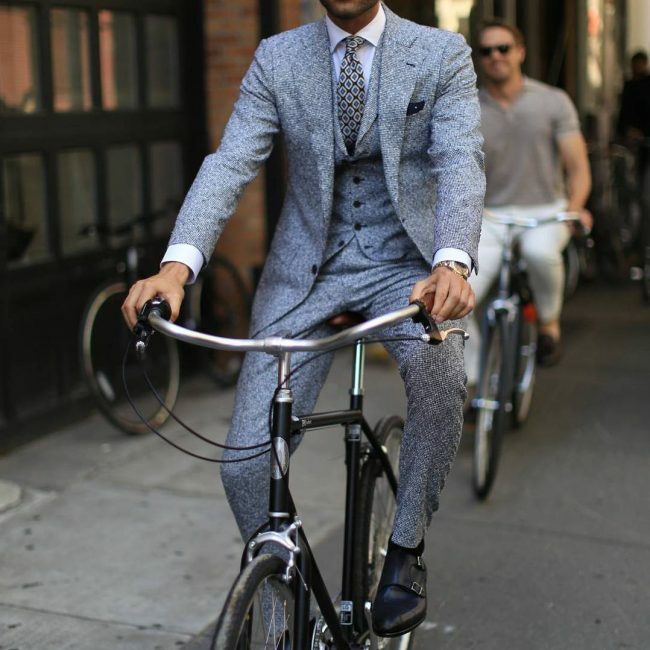 For more sophisticated look, wear a sunglass and a pair of black loafers too. Blue is a fabulous color that not only gives you a polished look, but also it surely enhances your style & sensation. 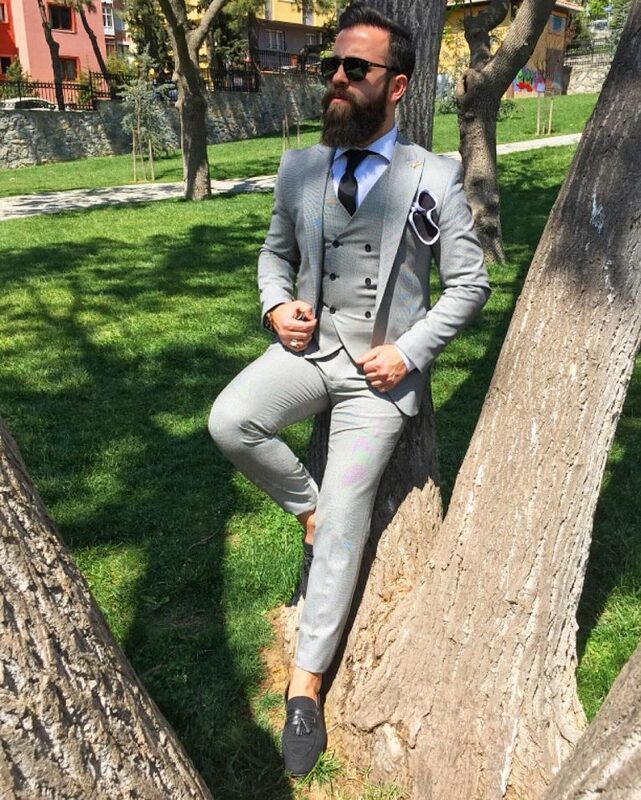 If you don’t believe, then ask your tailor to custom-make this incredibly elegant outfit. Wear it with a dark blue shirt, a stylish waistcoat, and a plain tie. 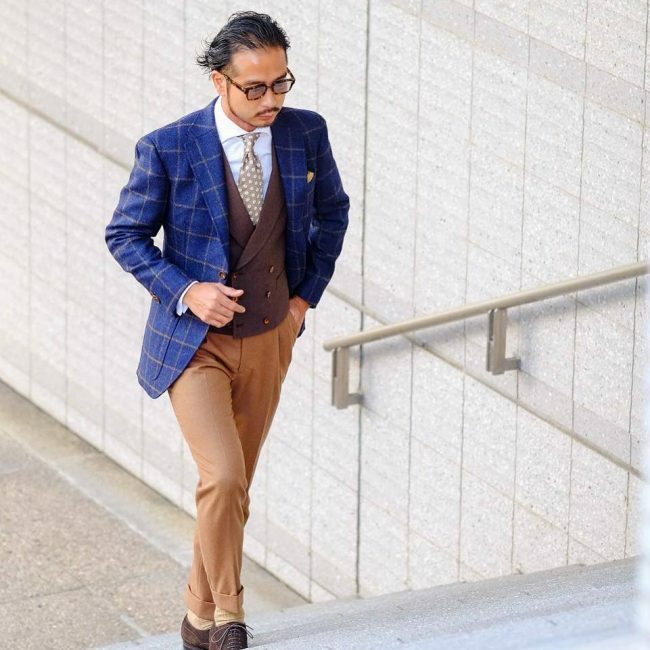 In this look, the model is wearing a traditional three-piece men’s outfit that comes in a great shade of brown (neither too dark nor light). This color clearly gives a fresh yet slick look. 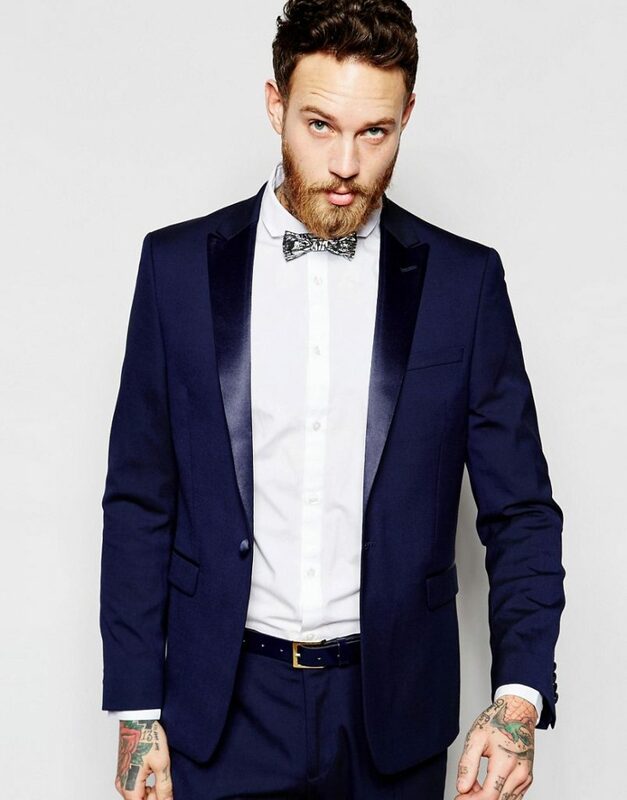 Remember to pair it up with a blue tie (just like the model). 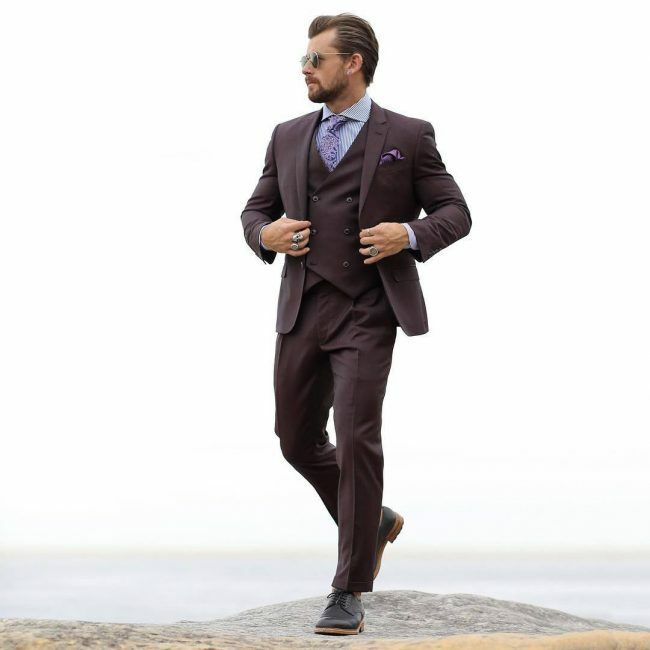 Many of you probably have a solid misconception that a three-piece men’s outfit only gives you a formal or traditional look. 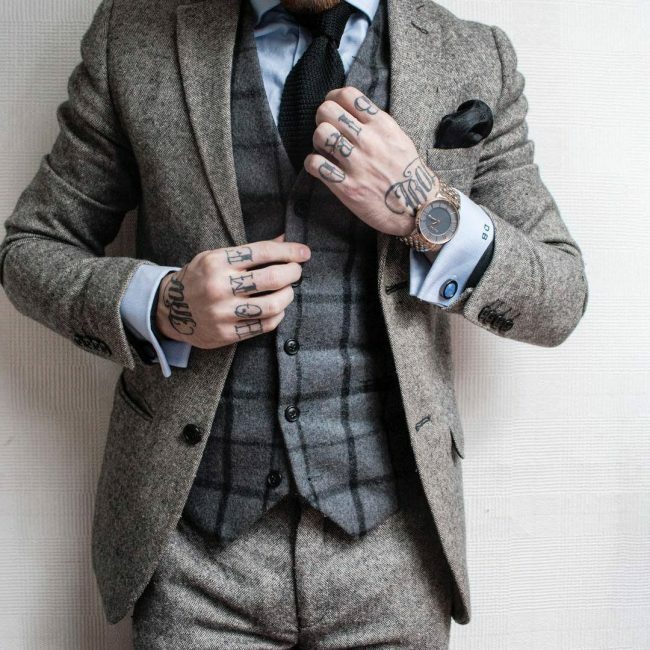 However, this outfit is a perfect example that gives you a flawless smart yet casual look. 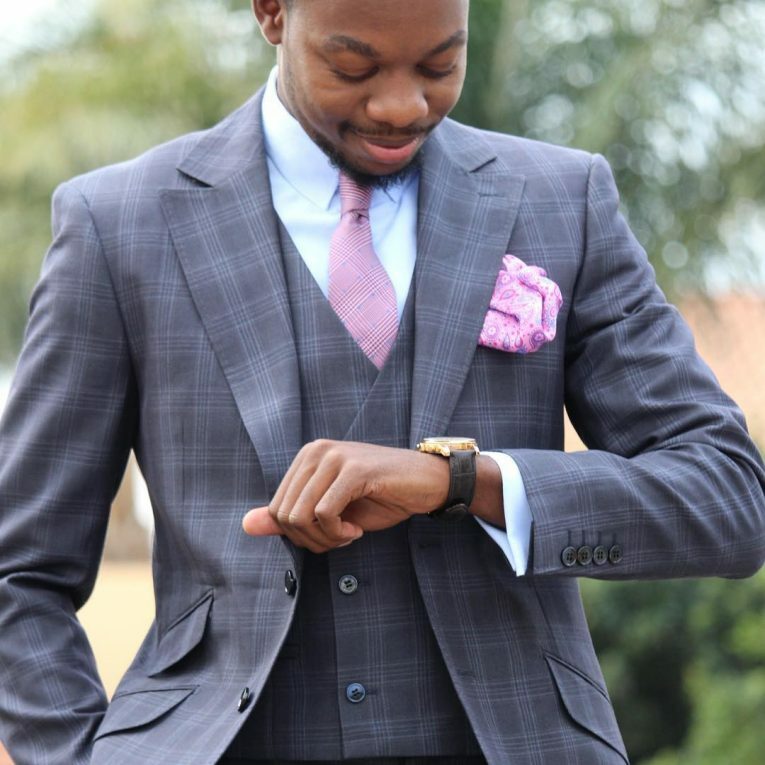 Here, the wearer has worn a traditional men’s outfit (in blue) but he has perfectly enhanced his style with a matching tie and a black wristwatch. 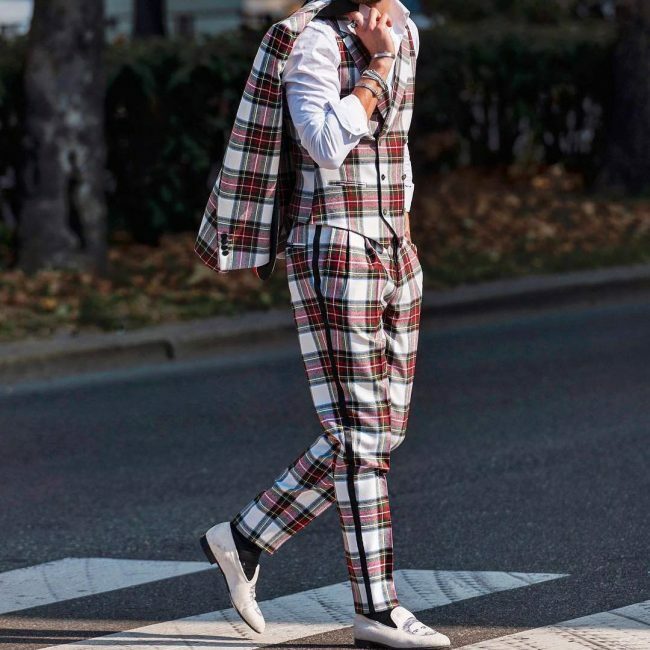 In this particular look, the model has worn a silvery gray check suit, a matching trouser (in gray), a waistcoat (of similar fabric) and a tie in dark black color. 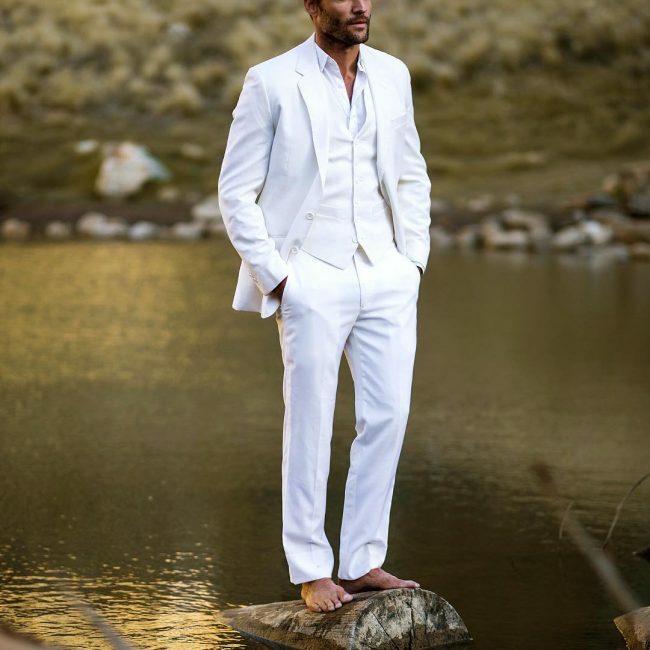 Here, the model is also wearing a white inner shirt which looks very appealing & elegant. When your designer can prepare an outfit like this one, you’re bound to get an unparalleled and the most sophisticated look. 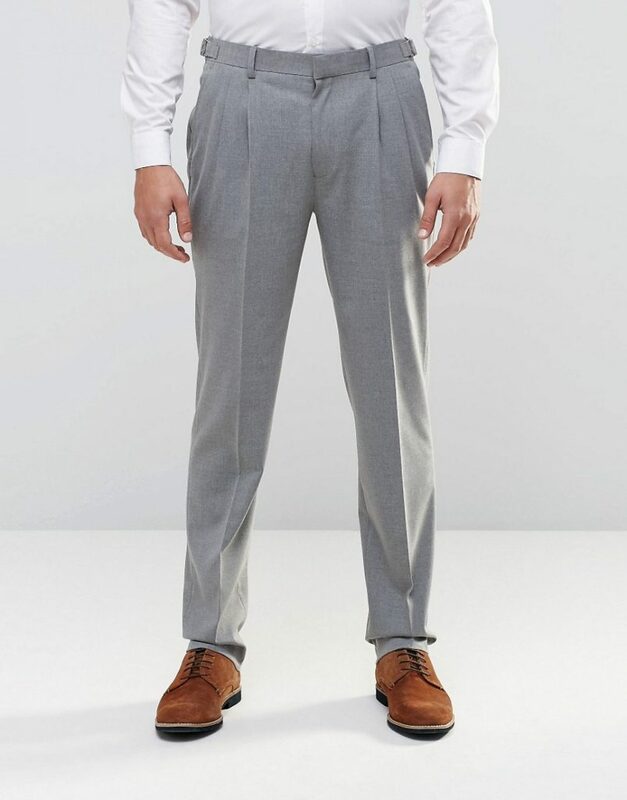 In this look, the model is wearing a gray-colored three-piece outfit, a check shirt, and a pair of brown men’s shoes. 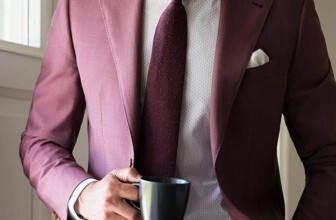 Here, the model is wearing a classic outfit in a nice shade of burgundy, a white shirt, and a formal brown tie. 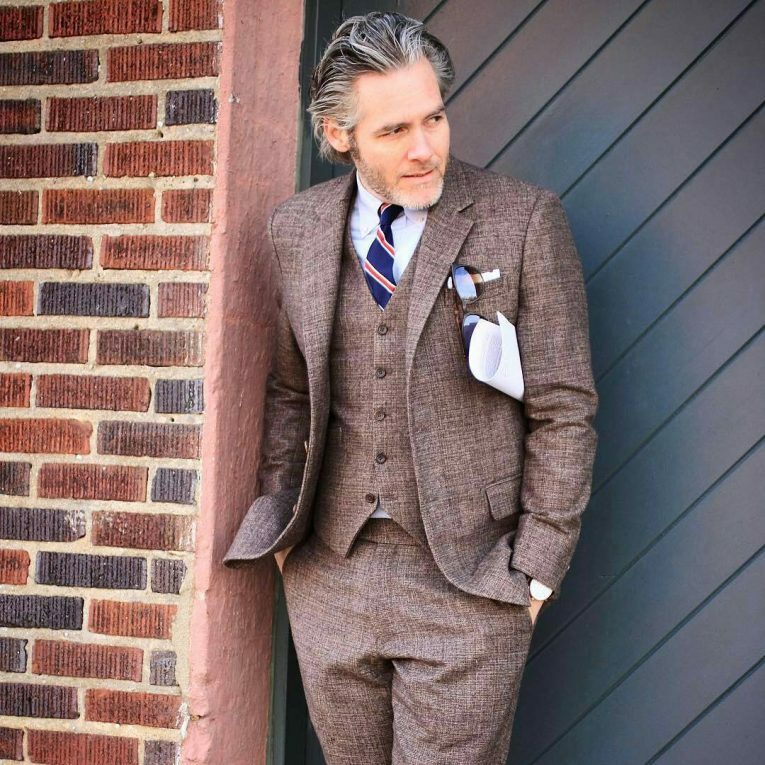 This is an absolutely gorgeous suit that gives the wearer a typical British look. 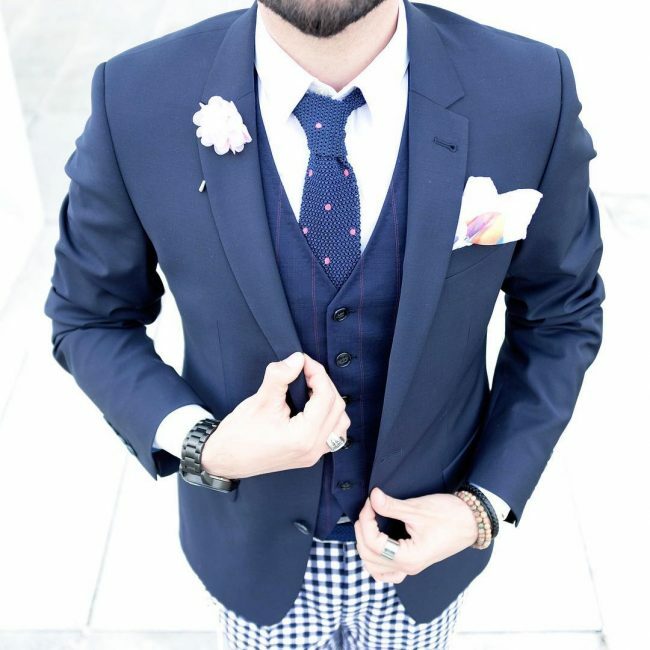 In this look, the wearer has stunned everyone by wearing an unconventional blue suit, a waistcoat having random patterns, plain shirt in white, a blue tie, and a sunglass. This outfit is absolutely perfect when you want a casual yet stylish look. 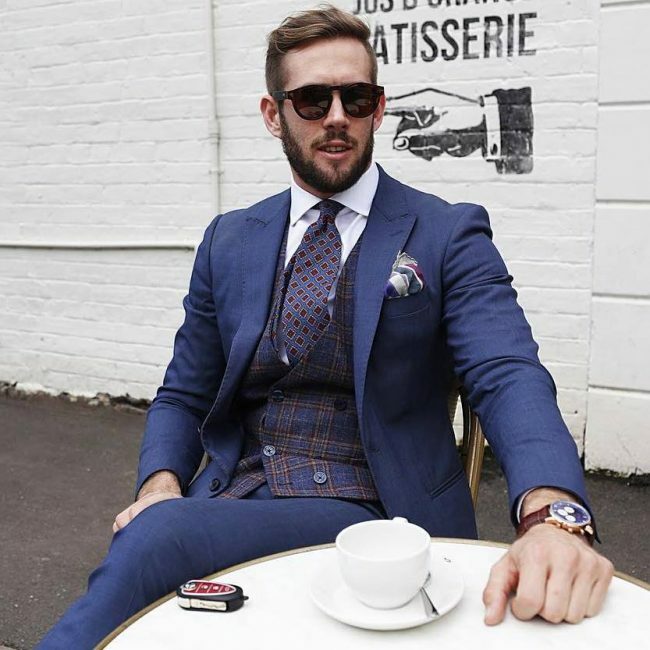 This is another example of classic & ultra-sophisticated casual look where the model has worn a beautiful suit, trouser, waistcoat, a denim shirt and handmade bracelets. Are you needing an appropriate balance between traditional & trendy look? 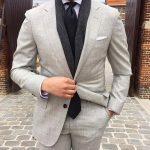 Well, don’t hesitate to try this suiting which comes with a complete three-piece men’s outfit in gray and a shirt (in white). 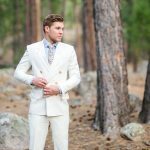 Here, the model is wearing a three-piece outfit in Oyster White color, a white shirt, and a tie in dark red color. This look is just perfect for any wedding event or special occasions. It’s too classy & this look can easily inspire your guests. 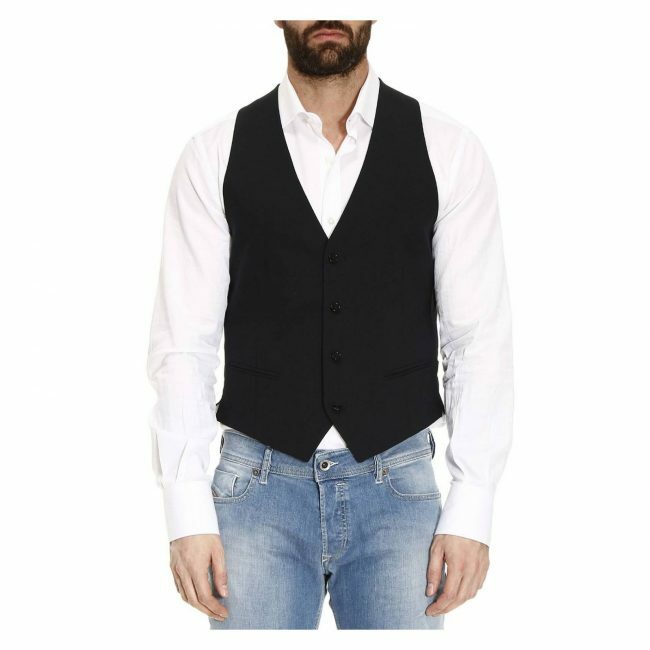 This look comes with a complete three-piece men’s outfit in classic blue color where the waistcoat comes with a random zigzag pattern. Pair it up with a blue shirt and a wristwatch and you’ll look majestic. This elegant and chic look is what you get when your designer prepares an outfit according to your exact measurements. Here, the color is shiny gray which looks even more stylish and classy. 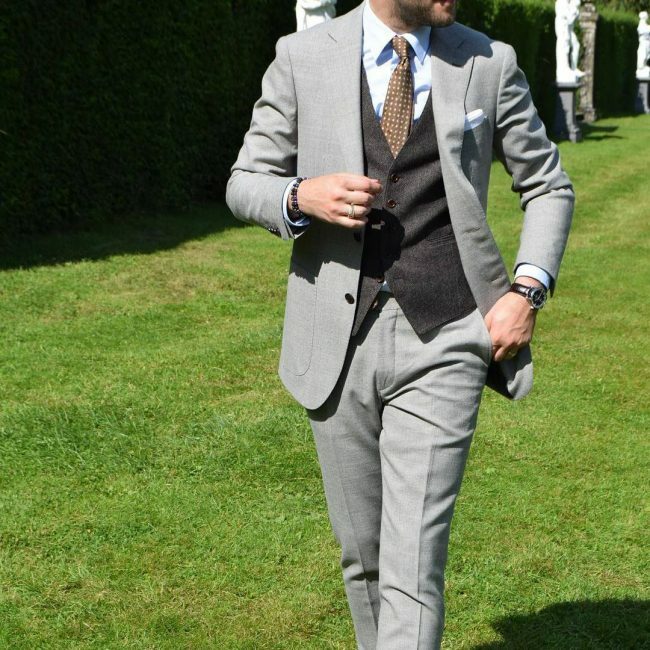 Gray suits and brown shoes just make an awesome match. 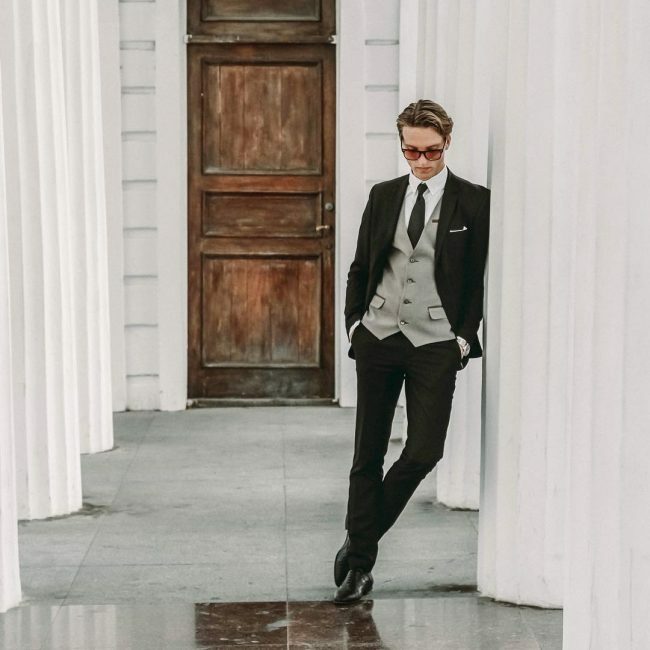 And when you spice it up with a stylish black tie & plain white shirt, you will look even more magnificent. 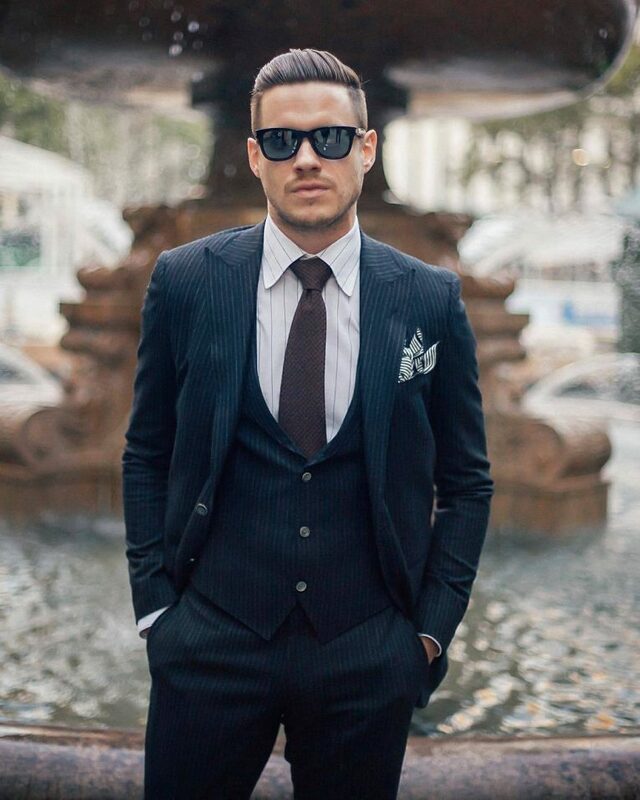 This attire gives you an ultimate professional or business look. 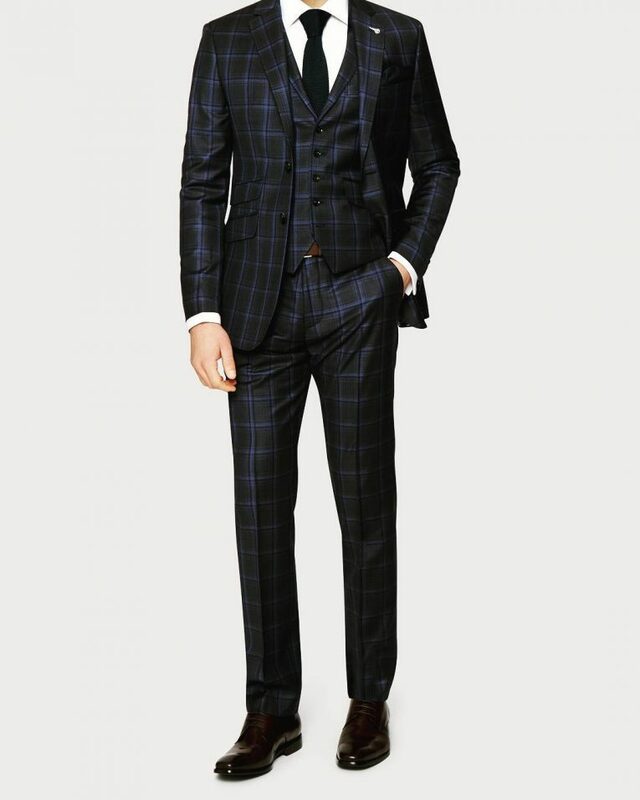 The dark tone of this suit is absolutely amazing, plus it gives the outfit an extremely elegant appearance. 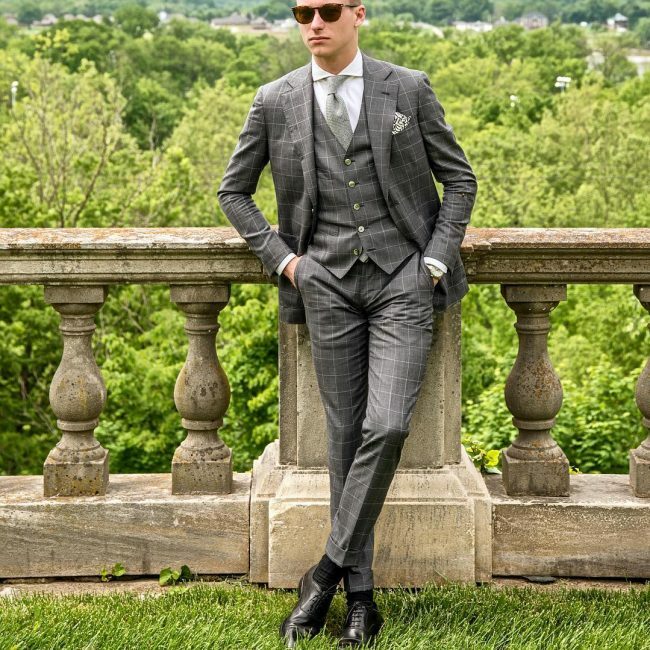 A simple black tie and a sumptuous watch – are the only other extra things that you’ll need for this look. 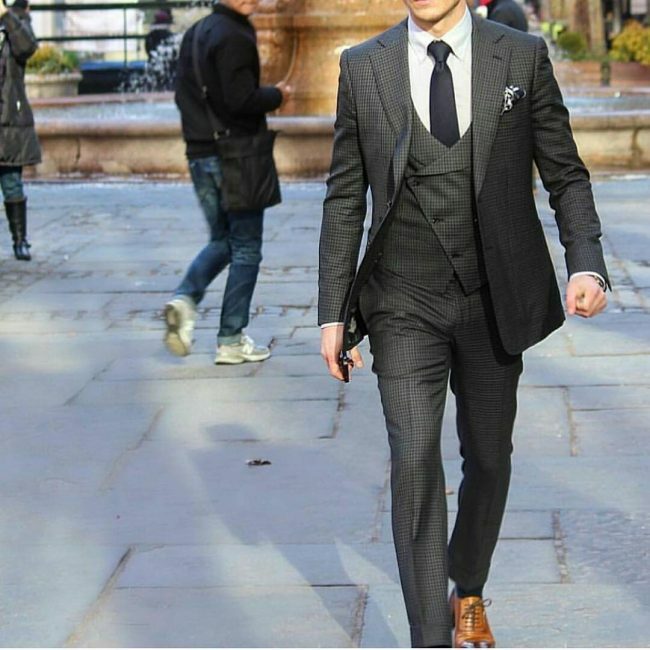 Look both adorable & extremely stylish when you have a famous & skilled tailor to stitch a classy suit like this one. 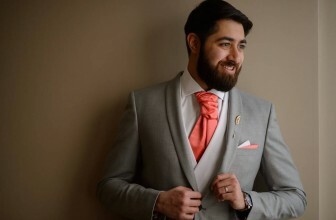 Unquestionably, the choice of color and fabric is top notch & pairing it with a simple white shirt and a dark black tie will surely add extra elegance. 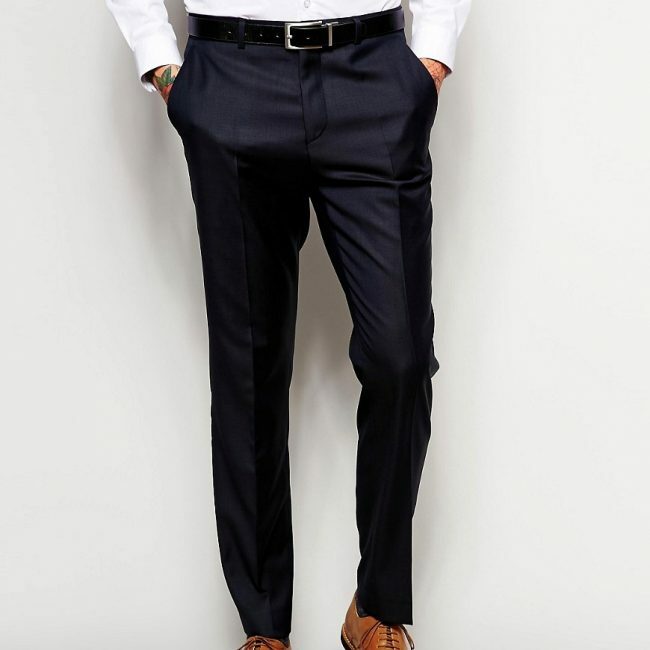 The modern fit of this suit is just what you’ll need for a sleek, casual, and stylish look. The outfit really has a fantastic material. 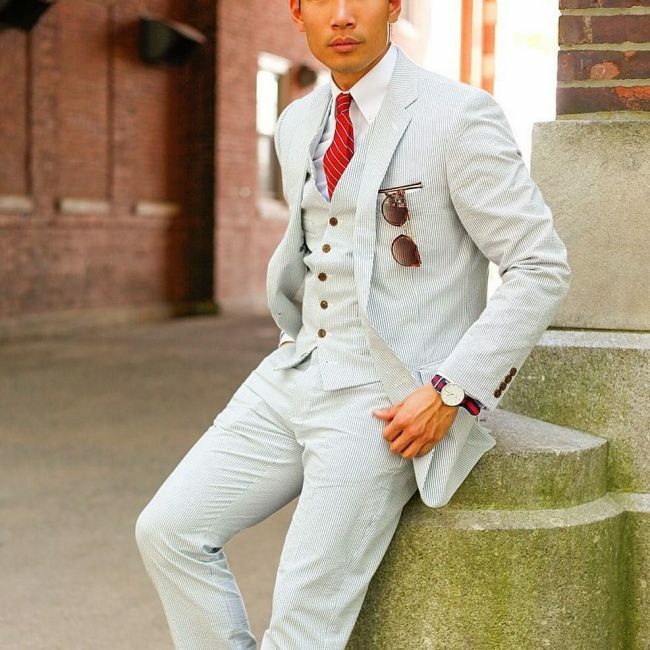 Pair it up with a simple tie (with random patterns), a light blue-colored shirt, and a pair of black formal shoes in order to get a sharp & unique look. 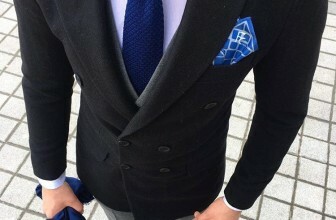 When you have a skilled tailor, you can easily make a sharp suit like this one. 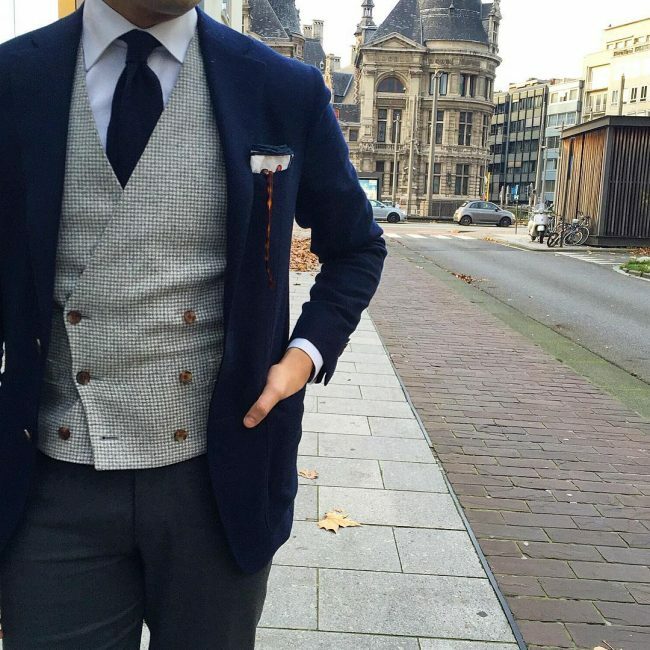 Everything from the waistcoat to the custom fit is just stunning & amazing. 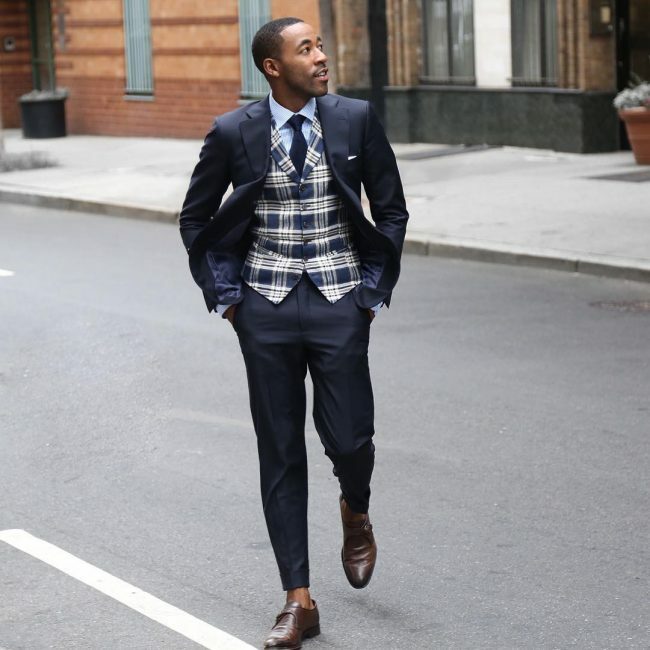 You’ll only need to pair it up with a trendy shoe, stylish socks, and a blue tie for a refined look. 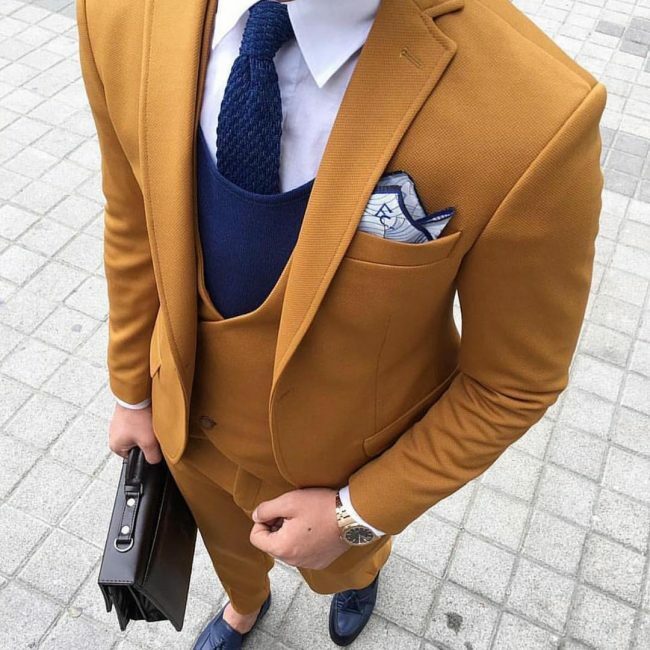 As you’ve now revealed this awesome collection of 40 three piece suits – make sure to try these fashionable outfits accordingly and show off your unabashed sense of vogue fashion. Not only it will boost your style and confidence, but also your closet will be stocked with quality fashion.